CHILDREN: Daughter, Jade (from a previous relationship, born in February, 1985); son, Winsor "Sonny" Harmon IV (with wife DeAnna), born May 2003. 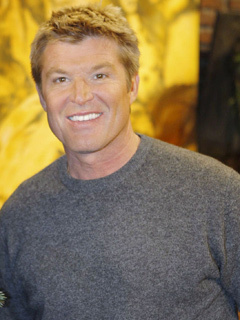 A self-admitted “good ol’ boy from the South, Winsor Harmon was born in Louisiana, then moved with his family to Rockwall, TX. A gifted athlete, he later attended Texas A&M University on a football scholarship, but soon became disillusioned with the “big business and politics” of college sports. Winsor quit A&M to aggressively pursue his dream of acting. Until he could make that happen, Harmon decided to pay the bills with modeling. However, a well-known agency in Dallas not only turned him down because of his bulky football physique (at 230 pounds! ), but also predicted he would never work in that industry. To prove the naysayer wrong, Harmon downsized within months on a vegetarian diet and was immediately hired by a competing agency. For several years, Harmon strutted on runways around the world, posed in numerous fashion magazines and appeared in several ads, most notably as The Marlboro Man. Harmon finally scored his first acting job when he was cast as Del on ALL MY CHILDREN. After that gig ended, he co-starred on ACAPULCO H.E.A.T. with John McCook (Eric, B&B), who rhapsodized about his current daytime role. Harmon would later become McCook’s TV son when he took over the part of Thorne. In his spare time, Harmon enjoys sports, martial arts, riding motorcycles, writing, and singing country music. He resides in Los Angeles with his wife, DeAnna, and their son, Winsor and her daughter August. Was born "at the exact moment that President John F. Kennedy was assassinated." Is the third in his family to have the name Winsor (his son is No. 4). Is the third actor to portray Thorne Forrester (the others were Jeff Trachta, 1989-96, and Clayton Norcross, 1987-89). Was once a boot designer in New York City; model Christie Brinkley was one of his biggest clients. Received a Soap Opera Digest Award nomination in 2005 for Outstanding Supporting Actor.